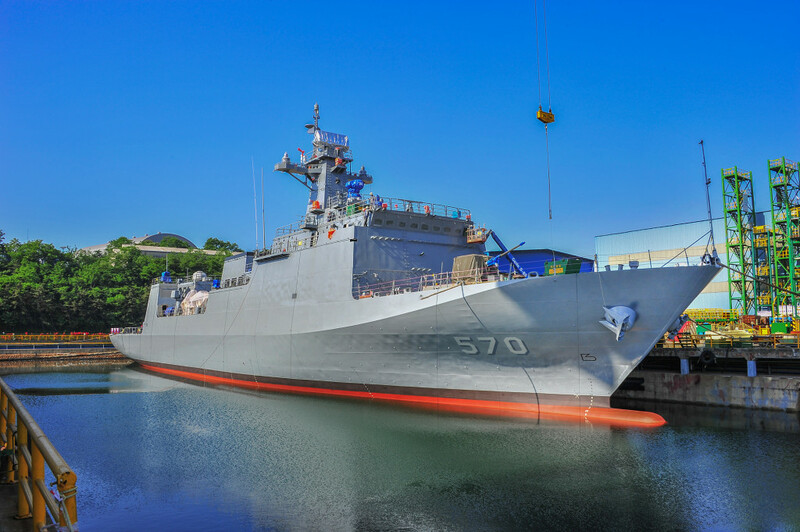 Hyundai Heavy Industries (HHI), the world’s largest shipbuilder, announced today that it signed a contract to build two 2,600 ton frigates with the Department of National Defense, Republic of the Philippines. The signing ceremony held in Manila, Philippines, was attended by Mr. Chung Ki-sun, executive vice president of Corporate Planning Office of HHI, Mr. Delfin Lorenzana, Philippines’ Defense Secretary and Mr. Kim Jai- shin, Korean Ambassador to Philippines and other guests. 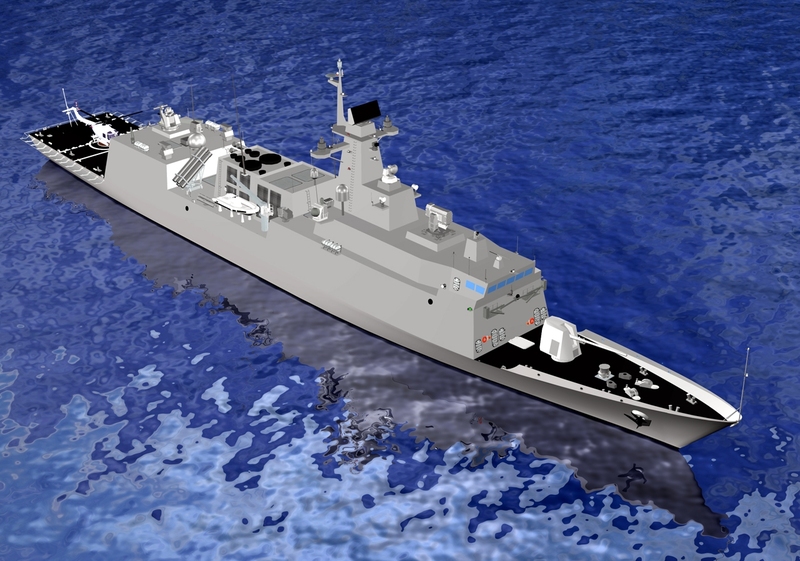 The frigates will be designed to be a smaller light combatant and successor to the Incheon class frigate which is now in active service for Republic of Korea Navy (ROKN) tailored to the requirement of the Philippine Navy (PN) with applying optimized range of good marine standard under naval rule from Lloyd Register, classification society. The 351 feet/107 meter frigates to be propelled with CODAD (Combined Diesel and Diesel) propulsion system with maximum speed of 25 knots/29 mph/46 km/h can cover 4,500 nautical miles/5,178.5 miles/8,334 km range at cruising speed of 15 knots/17 mph/28 km/h. The naval vessels will inherit the enhanced survivability, seakeeping and maneuvering capability of her mother ship operable up to Sea State 5. The frigates heavily armed with missiles, torpedo, guns and sensors controlled by the latest combat management system are capable of conducting Anti-Air Warfare (AAW), Anti-Surface Warfare (ASuW), Anti-Submarine Warfare (ASW) and Electronic Warfare (EW). The frigates are scheduled to be handed starting from 2020. Since the delivery of the first Korean-built frigate ROKS Ulsan (FF-951) in 1980, HHI has played a pivotal role in the modernization of ROK Navy designing major warships. And evidently it now expands its service to worldwide navies with advanced, affordable warships. According to Ridzwan Rahmat, IHS Jane’s Navy International correspondent, South Korean shipbuilder Hyundai Heavy Industries (HHI) has launched the Republic of Korea Navy’s (RoKN’s) seventh KSS 2-class (Type 214) diesel-electric air-independent propulsion submarine, the company announced on 5 April. 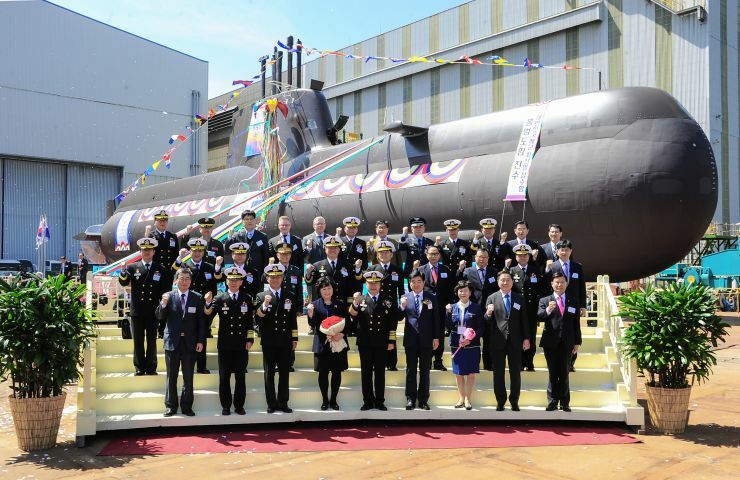 The 1,800-tonne Hong Beom-do (SS 079) was launched at HHI’s Ulsan shipyard on the same day in a ceremony attended by the RoKN’s chief of naval operations, Admiral Jung Ho-sub. Hong Beom-do (SS 079) is the fifth KSS 2-class (Sohn Won-yil class) submarine manufactured by HHI. The shipbuilder delivered the first, second, and third boats in the class between 2007 and 2009 and launched the fourth-in-class in July 2014. The first batch of these submarines is one of three, the second batch will be one of 6 and a $16 million deal has been awarded to SAAB for the electronics that are going to be used for the vessels delivered in the second batch submarines. The diesel-electric Air Independent Propulsion (AIP) submarine, which measures 213 feet/65 meters in length and 23 feet/7 meters in width, can sail at a maximum speed of 20 knots/23 mph/37 km/h with a crew of 40. The country’s largest-class submarine can dive up to 1,312 feet/400 meters and last for two weeks under water with fuel cells. Equipped with ultra-modern sensors and an integrated Command and Weapon Control System, it is optimally suited to its future reconnaissance and surveillance tasks. Beside Germany and Italy, South Korea is the third country operating submarines with the revolutionary HDW fuel cell propulsion system. 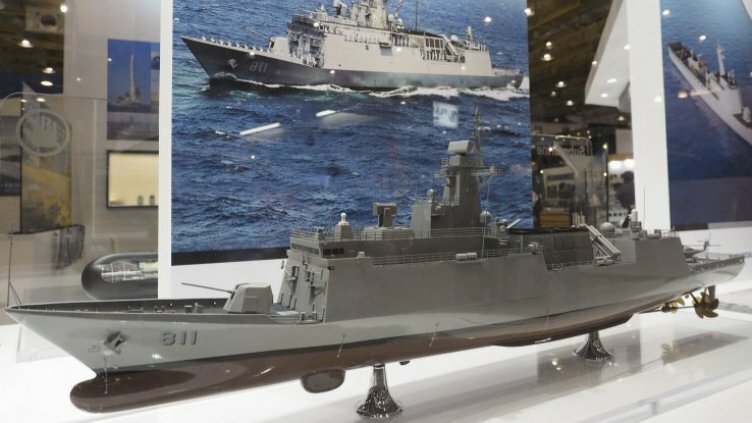 Hyundai Heavy Industries (HHI), the world’s biggest shipbuilder, announced on May 27 it launched its second minelayer MLS-II Nampo for the Korean Navy. The launching ceremony of the RoKS Nampo (570) was attended by Mr. Baek Seung-joo, Vice Minister of National Defense of Republic of Korea; Mr. Kwon Oh-gap, President & CEO of HHI; and 100 other guests. The MLS-II Nampo is both HHI and Korea’s second minelayer following MLS-560 Wonsan that was delivered in 1997 and are currently in operation. The MLS-II Nampo which can carry 120 crew measures 374 feet/114 m in length, 55.77 feet/17 m in width and 91.86 feet/28 m in depth with a displacement of 3,000 tons. The next-generation stealth minelayer is specially built to lay a large number of mines precisely at the designated spots in a short period of time. The MLS-II Nampo is scheduled to be delivered to the Korean Navy by October 2016 after outfitting work, sea trials and final inspections. HHI has been playing a key role in strengthening the defense capabilities of the Korean Navy by delivering a total of 71 naval ships including 12 frigates/patrol ships, 3 destroyers, 3 submarines, and 2 Aegis destroyers. The Republic of Korea Navy (RoKN) has received its third Incheon-class guided-missile frigate, delivered under the Future Frigate Experimental (FFX) programme, Ridzwan Rahmat, IHS Jane’s Navy International correspondent reported. 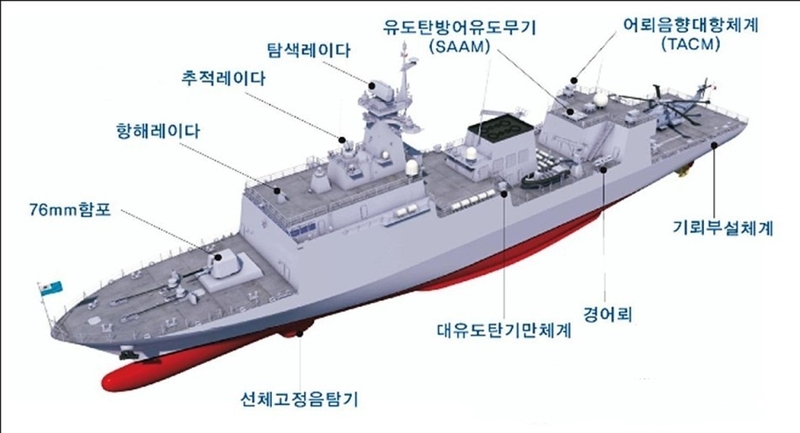 The news agency Yonhap cited the country’s Defense Acquisition Program Administration (DAPA) as saying that the vessel, named RoKS Jeonbuk (pennant number 813), will become operational in May following a four-month integration process. The warship is expected to take on roles such as maritime surveillance and anti-submarine patrol. Jeonbuk is the third ship in the class to be produced by shipbuilder Hyundai Heavy Industries. The company was also contracted to produce the first two vessels in class, Incheon (811) and Gyeonggi (812), commissioned in January 2013 and November 2014 respectively. Another local company, STX Offshore & Shipbuilding, has been contracted to produce ships four to six. IHS Jane’s Fighting Ships notes that a further nine ships are projected to enter service by 2020. This batch of nine will be built to a substantially revised design. Some estimates suggest that a class of up to 20 vessels in total may be procured. HDF-3000 type Frigate (official designation of the FFX) is the latest multi-purpose combatant. 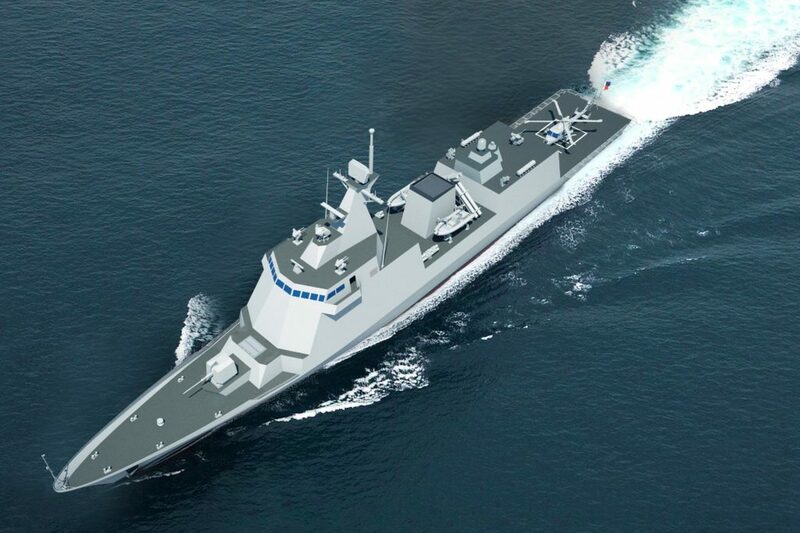 The modern, powerful, stealthy frigate will replace HDF-2000 Ulsan Class Frigate, which have been operating as major force of RoKN ever since delivery by HHI in 1980 HDF-2000H is derivative and 2nd generation of HDF-2000 with helicopter landing deck and hangar, applying stealth technology. Equipped with Raytheon’s Mk-49 RIM-116 Rolling Airframe Missile surface-to-air weapon, a Phalanx Block 1B Close-In Weapon System (CIWS), and a hull-mounted sonar, the platform offers improved Anti-Air Warfare (AAW) and Anti-Submarine Warfare (ASW) capabilities. As IHS Jane’s reported, the RoKN will deploy AgustaWestland AW159 Lynx Wildcat ASW helicopters on the Incheon class. The frigates’ six torpedo tubes (2×3) will carry indigenously developed K745 Cheong Sangeo (Blue Shark) 324 mm torpedoes: these weapons have a speed in excess of 45 knots/51.8 mph/83 km/h; they can also be operated in shallow waters such as the Korean peninsula’s West Sea. The Incheon-class frigates have a length of 114 m, a beam of 14 m, and a draught of 4 m. The frigates displace 3,200 tons at full load and can attain a top speed of 30 knots/34.5 mph/56 km/h. Maximum range is 4500 NM/8,334 km at a cruising speed of 18 knots/20.7 mph/33 km/h. The vessel is powered by gas turbines in a CODOG configuration (Combined diesel or gas). The new frigates accommodate a crew of 140.